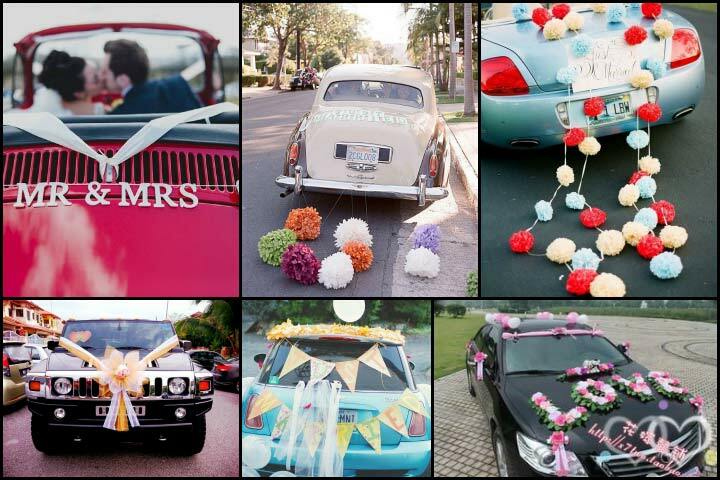 Wedding car decoration ideas that truly stand-out! If you’ve cared to notice, the little wedding car has a life of its own. Its got a personality, a character and a feel that is very “its own”. 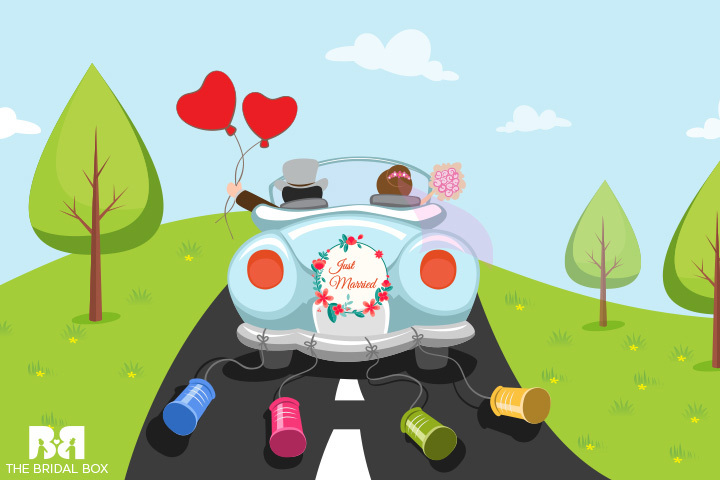 Those getaway cars are a part of your wedding story, and the parting picture is always the “just married” wedding car with those dangling cans. Read on, as we’ve got quite a list of wedding car decoration ideas for super cool getaway cars that will make your first ride as a wedded couple very memorable. Nothing is as lovely as an open-top beetle and your brand new bride by your side! Add some balloons and a retro “just married” tag and you’ve the prettiest getaway car in the world. Your dear car’s as graceful and gleaming as you are on your big day. Why make it monstrous with the leftover flowers the florist is trying to push. Stick with a simple wedding car decoration idea such as a stylish flower-net-over-the-bonnet style decor for your wedding car. A simple diagonal ribbon tied from the windscreen to the car’s radiator. Works best if the car is vintage as the look and feel of the car is highlighted. If there’s an old family car or a vintage beauty that you’ve borrowed for the wedding, then this is the best, and probably the most subtle way to decorate it for your wedding. Bow-ties aren’t just for the handsome groom and all the men at the wedding, but get one for your getaway car too! An extra large netted bow tie in white and yellow with a bunch of matching colored flowers on the boot of your car, is not just an offbeat idea but also a great one at that. A very easy DIY idea. Thermocol cut into alphabets to make it look like a Mr. and a Mrs. banner on a string. The cupids on each end of the string and a simple cloth-band decoration on top of the grill accentuate the look and appeal of this easy DIY getaway car decor. An easy decor idea if you are really not interested in the noisy tin cans, is to attach colorful and fluffy paper flowers to a rope and decorate the car with them instead of the getaway cans which are traditionally used. It’s an easy tweak for the above mentioned idea. You can have smaller paper flowers or paper balls, something you can easily get at the local convenience store. Top it with a “Just Married” board to the car’s boot to complete the look. The “Just Married” boards with easy-to-remove two side stickers are also available at the convenience store, so it’s almost a ready made DIY idea. An extra large netted ribbon stylishly designed to sit on the radiator grill in the shape of a beautiful flower while the ribbon goes all the way to the windscreen at both the ends. 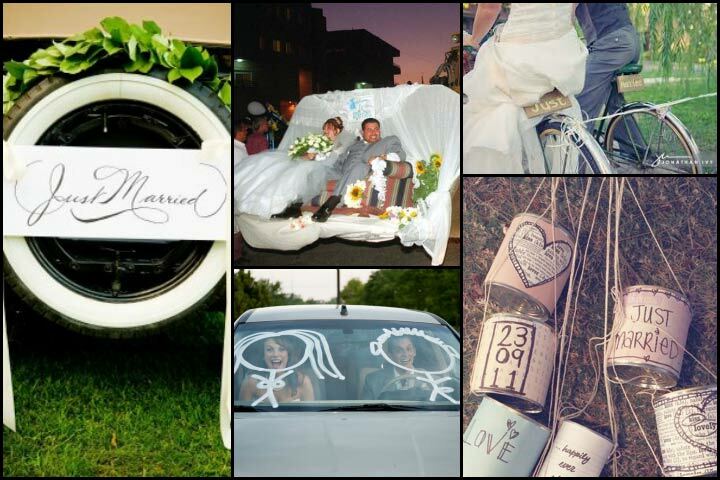 A wedding car decor idea that will get you noticed! A mix and match of style, design and lots of ideas to make your Mini Cooper truly stand out on your big day. Cooper’s are cut cars and giving them a personal touch with ribbons, banners and anything else you want to have on your getaway car only multiplies their appeal. A perfect getaway car for a Cooper loving couple. A beautiful decor theme in white and pink, using a lot of materials from flowers, ribbons to balloons and real leaves. The highlight of this theme is the “Love” shaped arrangement of flowers and leaves on the bonnet which is perfect for a wedding getaway car. Beautifully arranged pink flowers on the doors of the getaway car with white ribbons hanging down the sides, give it an appeal and subtle style like no other. A very elegant wedding car decor idea. A pretty netted ribbon and sunflower design idea that will surely be appreciated by one and all. With a pair of big and beautiful sunflowers at the grill and one each at the rear-view’s, this decor is easy to put up and very pretty. Why do you want a getaway car when you could have a getaway bike or even better, a beautiful old Victorian Horse drawn carriage with a “Just Married” banner at the back. 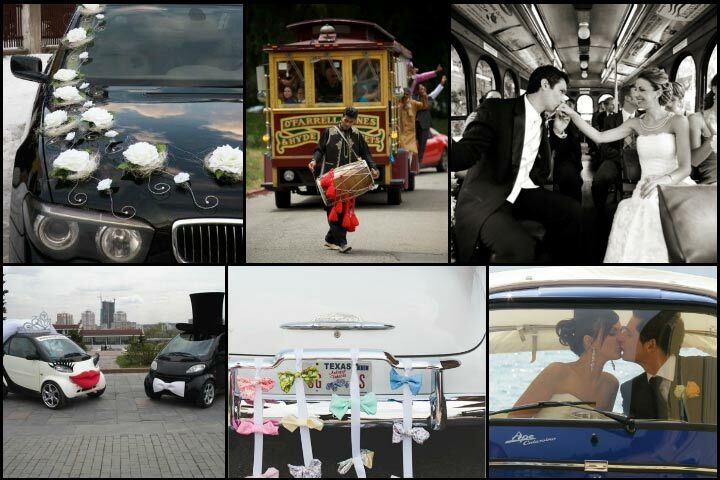 These are not exactly decorations but different ideas that you can look at to make your wedding day and the getaway ride extra special. A white rose carpet design all over the getaway car with a very pretty and offbeat design of the wedding rings on the roof of the getaway car. A decor idea that will get noticed and surely appreciated. Imagine having a water tricycle decorated with a “Just Married” banner as your getaway ride. 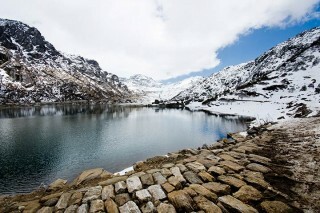 You could peddle your way to a beautiful place or an exotic island for your honeymoon. Just another idea, that can make your getaway ride truly standout. A very simple pure white satin bow at every door handle. It cant get simpler yet stylish than this. A subtle decor idea for your wedding getaway car. 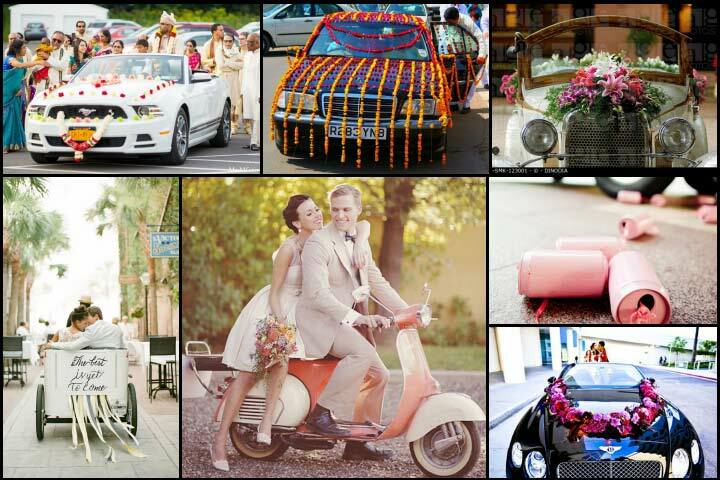 A traditional wedding car decoration with Indian style garlands and local flowers is also an idea you can consider. Just tell the decorator to be a little less garish on the garnish, we are sure the traditional Indian getaway ride decoration would look good too. A simple DIY idea that can keep your kids busy. You can collect all the empty cans and home and hand paint them in pink, and tie ’em up to a pink ribbon or thread to gift yourself the easiest wedding car decor idea ever. A simple idea that was very popular in the 90’s, where you’ve rows of flowers placed horizontally and vertically to make your wedding car look like a checkered flower garden. 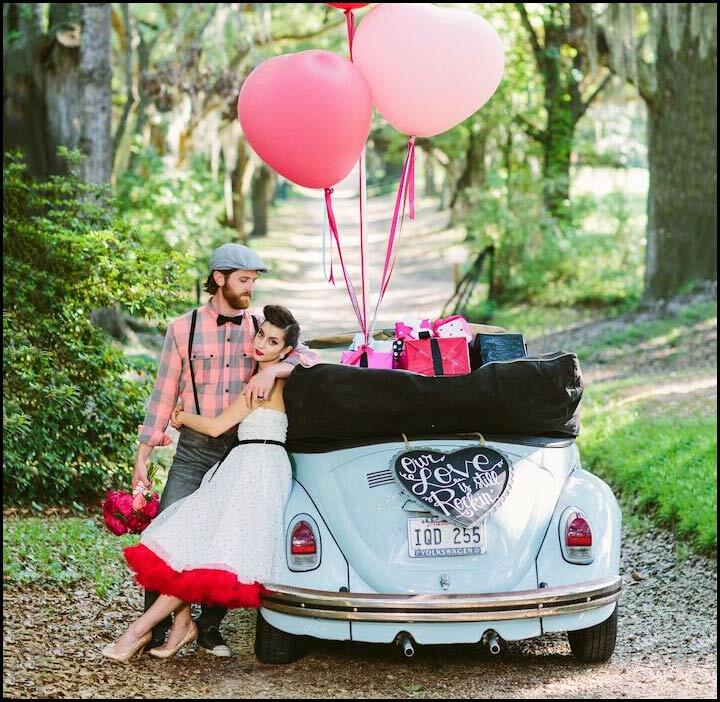 A beautiful wedding car decor idea if your getaway car has a high and flat bonnet or is a vintage beauty. A bunch of the most exotic flowers arranged on the bonnet and the boot to give your getaway car the most classy look ever. A stunning decoration theme that will just add to the appeal and the grandeur of your wedding. 21. Why not a Speed Boat? Why does a getaway ride always have be a car? A beautiful speed boat as a getaway ride could be an awesome idea. Clooney did it in Venice this year, so why not you? How cool would it be to have a traditional rickshaw as your getaway ride? It’s slow, it’s cozy, has an open top and its definitely not regular. The easiest off-beat getaway ride to have at your wedding. This is another offbeat wedding getaway ride idea. 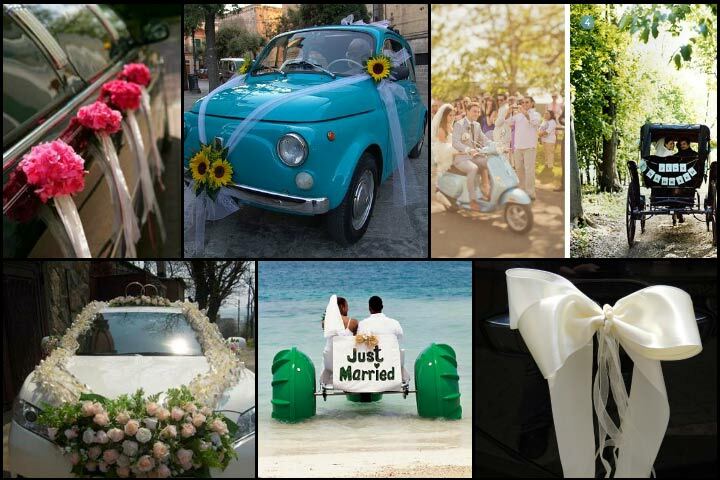 How cool would a colorful Vespa be at your wedding, as the getaway ride. 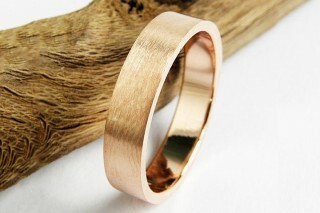 Something that is stylish, trendy and surely makes a statement. A very big and thick all-pink flower garland that flows over the wedding getaway car’s bonnet. Just a garland, and you will be surprised that it makes a pretty big statement. 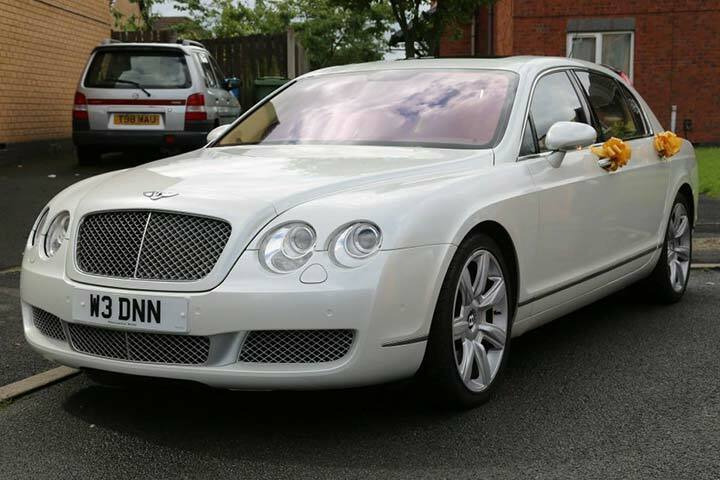 The Bentley in the picture just proves that this design idea works, and how! A very beautiful and stylish flower themed decoration that leaves three-quarters of the wedding gateway car untouched. It is only a subtle border kind of style that makes a big impact with its style and placement of flowers. A decor theme that suits the darker shades or colored cars the best. If you want your car to be untouched, yet have subtle decoration to mark the special daythen this simple bow tie on the door handle is your best bet. Bonus! 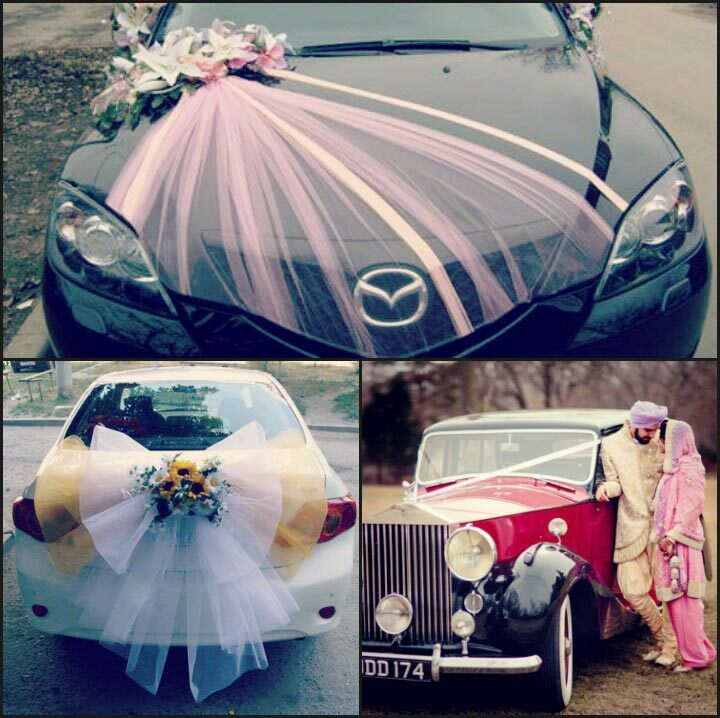 Here are some more amazing wedding car decoration ideas for you.